I know that the happy feely spirit of Christmas time is now cliche and overblown in a world where people trample each other in order to buy crap. It’s an image that we like to believe in, but is diminished less and less every year, when now Christmas decorations go up on store racks barely after Halloween is over. But that’s the cynic in me. Truth is, aside from all of that, I still love the Christmas season. When I was growing up, we didn’t have money. I lived in a double wide mobile home, off of an old mining road, and my parents were hippies. My dad put in all of the septic, plumbing, electrical work, and even had our own well drilled. My mother made our clothes and cut our hair. When my sister and I got toys and games, it was at Christmas and on our birthdays. A lot of them came from other relatives, but my parents always did what they could to give us the things we wanted. Of course that would give kids a warm feeling, and fond memories of holidays, but that part of it is really just about the stuff. The other side of it is the great memories. The sense of family and love. When my great-grandparents were alive, we would drive for hours to their house for a large, extended family Christmas. Relatives from all over would come, and there would be a huge feast, of which the only thing I remember was stuffing myself with Swedish meatballs. Their living room was large, filled with decorations, a giant tree, and a crackling fireplace, and after the children waited impatiently for the adults to finish eating, we would all gather around in a circle and take turns opening gifts. At some point in the evening, Santa would come knocking at the door, handing out even more gifts to us kids. There was laughter and bonding, sharing and playing, and always good memories. Then it was bedtime, and it seemed that every year we would sleep someplace different, depending on our order of arrival. Some years it was the den, with the TV and comic books, other years is was the downstairs room that I was convinced was haunted, or sometimes even one of the nearby family’s houses or cabins. The next morning was equally magical, when all the kids would gather in the living room, once again waiting for the adults to finish breakfast as they stared in anticipation at the filled stockings under the tree. My great grandmother had a chirping bird that would always be hidden somewhere in the tree, and we would all try to see who would find it first. Eventually, one by one, the families would leave, and I still have memories of my grandparents and great grandparents standing in front of the house, waving at us as we drove away, until they were completely out of sight. That was the big Christmas, but there were always more intimate ones when we got home. That was where the few presents my parents would get for us were under the tree. We always got to open them on Christmas eve, and saved just one for Christmas day. I remember very few of those presents, not because they weren’t as good, but because they were overshadowed by the other memories. Listening to Nat King Cole on the 8 track player. Sitting on the floor in the near dark, staring at the colorfully lit Christmas tree, and squinting to make the lights become like little stars. Interestingly, there are a couple of things that take all of those feelings and put them into focus for me. When we would open our stockings at home, one of the things inside was always a toy capsule. There are two specific models of toys that I remember. One was a wind-up robot with a dome head, where one year I got a blue one, and the next a red one. 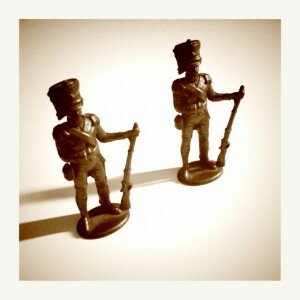 The other was a small, metal, soldier figurine with a shako headdress. When I think of them, I sill remember all of the feelings that I associate with Christmas from my childhood. I still have two of the metal figurines, and from time to time I take out of the wooden chest I keep them in. I’m still unsure if they make me happy, or melancholy. A bit of both, I think. All of this, while wonderfully reminiscent history to me, and most likely very uninteresting for other readers, leads up to why I can’t seem to find the “Christmas spirit” this year. You see, as I got older, it became more important for me to capture the *feel* of Christmas that I grew up with, and when I could, share it with others. I rarely spend the holidays with my proper family anymore, but instead spend it with others I consider family by association – friends, significant other, etc – and of course my son. There was a time, not so long ago, when I would decorate two trees in my home, so that I could move from room to room and still be able to see one. I revel in walking or driving around, admiring decorations that others put up. Even when not holiday shopping, I still enjoy looking, because of the feel I get from these things. It’s not just the decorations though, it’s what they signify to me. They remind me of how loving, caring, and giving people *can* be. During this season, I use that to fill my emotional reserves with warmth and love, so that even when people don’t demonstrate it, I can use that energy to remind myself of the goodness in them. But I haven’t been able to do that this year. Life has been busy, and whether it’s because of work, stress, or just too many things I see as necessary to do, I haven’t had the opportunity to immerse myself in the holidays. It has become about the stuff, and not about the feelings. Yes, I’ve wrapped the presents and put them under the tree, but the tree only went up a few days ago. I only just started listening to Christmas music. And I’ve gotten almost no opportunity to observe and absorb the holiday decor. I know that these are things that many people I know shun, as signs of the commercialism that has consumed the whole season. But it’s not like that for me. It’s the opposite. They are the things that allow me to forget and forgive everything else. That allow me to still have hope that people can come together, despite their differences. Without all of that, I find myself bitter and sad this season, missing a huge part of my life that once was.